FRIDAY, Oct. 28 (HealthDay News) — Moderate exercise may help strengthen knee cartilage and improve joint symptoms and function in people with knee osteoarthritis (OA), says a Swedish study in the November issue of Arthritis & Rheumatism. The study included 29 men and 16 women, aged 35 to 50, who’d had meniscus repair within the previous three to five years. The study volunteers were randomly assigned to either an exercise group or a control group. Those in the exercise group took part in a supervised program of aerobic and weight-bearing exercise for one hour, three times a week for four months. At the start of the study, both groups had MRI scans to evaluate their knee cartilage. They also answered questions about their knee pain and stiffness, and their general level of activity. At the end of the study, many people in the exercise group reported gains in physical activity and functional performance, which were confirmed using aerobic capacity and stamina tests. MRI scans revealed positive changes in the strength and elasticity of their knee cartilage. “This study shows compositional changes in adult joint cartilage as a result of increased exercise, which confirms the observations made in prior animal studies but has not been previously shown in humans,” researcher Dr. Leif Dahlberg said in a prepared statement. “The changes imply that human cartilage responds to physiologic loading in a way similar to that exhibited by muscle and bone, and that previously established positive symptomatic effects of exercise in patients with OA may occur in parallel or even be caused by improved cartilage properties,” Dahlberg said. 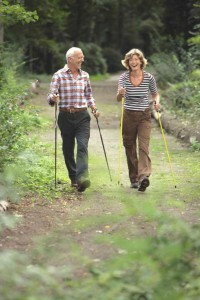 The American Medical Association has more about knee OA.